1. Groom your horse. While it's best to give your horse a full grooming before every ride, at the minimum, it's essential to groom the area where the saddle will sit. Make sure there's no mud or other debris in the saddle or cinch area, and check for sores. 2. Check your saddle, pad and cinches. Make sure there aren't any burs, dirt, straw, or anything else on the underside of your pad, saddle and cinches that might cause an irritation or saddle sores. 3. Place the saddle pad. 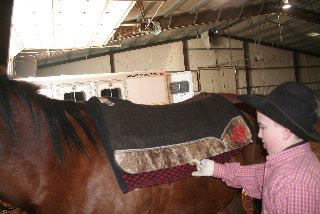 Gently place the saddle pad on the horse's back, forward of the withers. 4. Prepare your saddle. 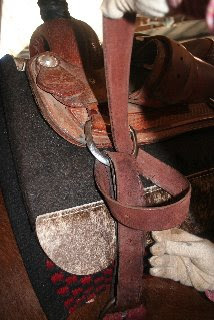 A western saddle has a number of straps that can get in the way of saddling. Prior to placing a saddle on a horse, make sure that all of the straps are secured. While some folks simply throw the straps over the seat, we recommend securing each strap. Make this a routine each time you unsaddle and your saddle will stay nice and tidy and you'll be all ready for the next ride. Latigo - We like thread our latigo through the leather slot just above the cinch. You can run it through a couple of times or just once depending on the length of your latigo. Cinches – Hang your flank cinch buckle on the buckle tongue of your front cinch buckle as shown. 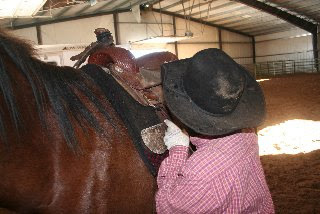 Thread the saddle keeper under the cinch buckle and hook it on the buckle tongue. Breast Collar - Lay the breast collar over the seat of the saddle. Or we like to hook it over the saddle horn. 6. Adjust the saddle and pad. Slide both the saddle and pad backwards into place by holding on the horn and jiggling the saddle from side to side and back. It should settle into the correct spot. As a rule of thumb, the correct spot will leave a space between the horse's elbow and the front cinch of no more than three finger widths. The saddle should be centered on the pad with the same amount showing on both sides. There should be at least an inch showing in front of the saddle. Make sure none of the saddle strings are caught underneath the saddle. When we do up the front cinch we like to tie it so that it doesn’t come loose as easy. As a rule of thumb you want your front cinch tight but still able to put two fingers in between the cinch and your horse. If you are going to be roping or speed events make sure that you check your cinch and it is tight. When the front cinch is connected, you can than connect the flank cinch if you have one. Reach under the horse's belly again with your left hand and grab the flank cinch. 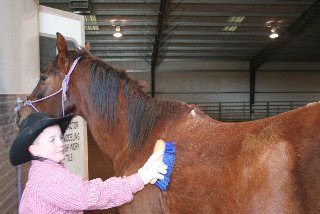 Buckle the flank cinch so that it is snug but not tight. You should just be able to slip your hand in between the horse's belly and the cinch. 8. Connect the breast collar. From the near side, reach around to the breast collar that was let down in the earlier step. Connect the near side rig (or tug) strap to the D ring on the front of the skirts or the front rigging rings. It should go without saying that you must connect the rig straps to the same rings on each side. 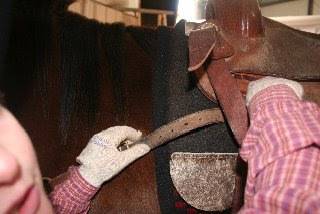 Next, feed the center tie-down strap through the horse's legs and connect it to the front D ring on the center strip of the cinch. When you're riding with a breast collar, it's very important that the center strip of the cinch fall in the center of the horse's belly. If it's off center, the breast collar won't be as effective and the breast collar tie-down strap can rub on the inside of the horse's leg. Now you're ready to ride! Use this technique to saddle your horse the same way every time. Establishing a routine will ensure that you don't miss a step and it will create a positive partnership with your horse. He'll know what to expect and he'll know it will be a positive experience. You gotta love it when you rope curls in Breakaway Roping. Nice loop! Success in rodeo or in life is truly up to you. Once you decide that you create your life, then you can accomplish anything. Set your goals, fulfill your dreams, and use everyday you have. You set a Goal whenever you say, "I want to..." Your Goal might be that you want to get a pet dog. Or that you want to learn to dance - or to play football well. Or your goal might be to get better grades at school. For example, I set a goal to become the National Little Britches Rodeo Association Princess. When you have a Goal, it gives you something to look forward to. Goals are kind of like a ladder. We start at the bottom of the ladder and with each step we take to reach our goal we climb the ladder until we are at the top achieving our goal. When is a Goal a good Goal? 1) A good Goal says EXACTLY what you want. 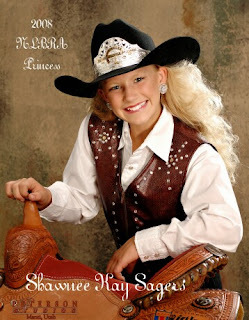 For example, when I set my goal to become the NLBRA Princess, I didn’t just say “I want to be a princess.” Instead, I said “I want to become the 2008 National Little Britches Rodeo Association Princess.” Once I had the goal imagined exactly as I wanted to achieve it I wrote it down. You can choose any goal you want for yourself, but remember, in order to really have a goal you must write it down! 2) A good Goal says WHEN you want it. When I decided what I wanted my goal to be then I had to set a target date for when I wanted to achieve the goal. I had it really easy because the date was set for me because it was a competition. You may have a goal to get better grades in school, so you may have a certain time you MUST have it done. But, you may set a goal that doesn’t have a certain time for completion. If this is the case you need to set your own time. 3) A good Goal is when you believe it. In order to reach a goal, you must really believe that you can achieve the goal. For example if you say ”I want to play in the NBA next year.” that isn’t a real goal. However, if you say “I want to play in the NBA when I am 20 years old.” That is a goal that could happen. For me, I have a future goal of becoming Miss Rodeo America by the time I am 24. I knew that I could not set this as a goal for right now, but becoming the NLBRA Princess is a smaller goal that I could achieve right now, and it also helps me get closer to my future goal. If you believe it you can do it. 4) A good Goal says HOW you're going to get it. In order to reach a goal, you have to list the steps it will take to do that. For me I knew that I had to practice all of the parts of my contest. I wrote down things such as when and what to practice, I set a daily schedule for myself, I made up and took practice tests, I had to practice riding my horse each day. No matter what your goal is you need to write down and then follow the steps that you must take to reach the goal. You will know when you have reached your goal because certain things happened. I knew that I had reached my goal when I had completed my contest and had been announced the 2008 NLBRA Princess. In order to reach a goal, you must really want to do it. I suggest writing things down that will help keep you motivated. If the goal is worth achieving, it will be very hard at times. Good goals require work. Sometimes you can become discourages. By writing down some reasons why you want to keep working on your goal you will be more likely to stick to it. I stayed motivated even during the HARD hours and hours of practices because I knew how exciting it would be to win the saddle and wear the crown. I keep a picture of the 2007 Miss Rodeo America as the wallpaper on my phone also, because looking at her helps to remind me of my goal. Sometimes we don’t achieve our goals the first time. Does this mean that we have failed? Absolutely not, Thomas Edison failed many times before he successfully made a light bulb. Can you imagine if he had given up on his first failed try? Luckily for us he kept trying. I too, failed my first try. I set a goal to be the 2007 Princess and was awarded the 1st attendant. This didn’t stop me from trying again, in fact, it made me try harder to achieve my goal the next year. I truly believe that each one of you has the ability to do or become whatever you want to, But, life will pass you by and your wishes will just be wishes if you don’t set goals and stick to them. Although I work full time and have 2 kids to keep up with, I really enjoy contributing. I am not the type of person who can sit at a rodeo and just watch. So in addition to my full time responsibilities, I volunteer as much as possible. 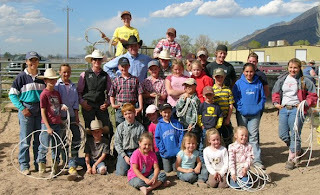 I teach 4H every Thursday, secretary for Central Utah Little Britches, jackpot secretary for Central Utah Junior Rodeo and put together the program for the Juab High School Rodeo team. 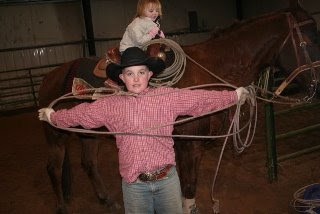 The best part is knowing that what I do benefits the kids who are working, riding, roping and practicing hard each day. For some moms, they may feel a little out of place at a rodeo. They may not know how to help. When I first started volunteering, I really had no idea how to do a rodeo payback. Someone knew that I worked with computers and was good at math. So they said can you help do our jackpots. Of course I said yes. But I still had to learn how to calculate the number of kids, the entry fee and the percentage to pay back. Now, I organize an entire rodeo. 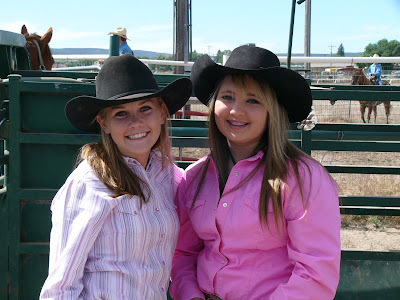 Junior rodeos especially are made up solely of volunteers. The people timing, helping push cows, opening and closing the gate, and being the secretary are doing it to help the kids. 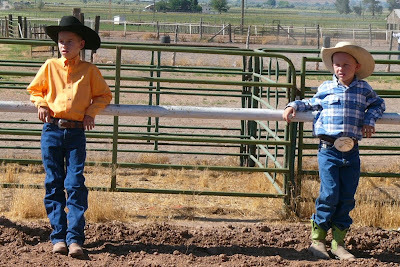 If you are at a junior rodeo and want to, just ask what you can do. Normally, all committees would really appreciate any additional help. Even if you don’t know what to do ask and someone will teach you. It really is a learn as you go thing. Even if you just help open and close a gate that frees someone else up to move cows or set up the barrels. So don’t be afraid to jump in. It will be greatly appreciated. I also want to send many thanks to the volunteers. I am always amazed at the amount of time and dedication that people volunteer for junior rodeos. Thank you, thank you, thank you!!!!! Gotta love the way cowboys stand. 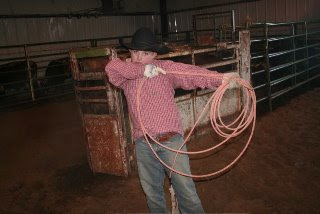 We were practicing roping on Sunday. During the winter in Utah, we have to ride indoors. So we have to haul the horses, the cows and all of our equipment to the indoor arena. We spent over 4 hours between practicing and hauling horses, kids and cattle back and forth. This is what our life consists of constant practice, chores and traveling to the next rodeo. We were having dinner on Sunday night with my brother and sister in law who came down to help. As we discussed the days events, my daughter says hey mom when are we going to get a new dishwasher? (Ours broke about a week ago.) My reply was well we have 2 rodeos to enter in March and several more in April. So probably not until next fall. That is when my sister in law and I both laughed. Rodeo is not an event. It is even more than a sport. It is a lifestyle. You have to live it to understand it. I really had no idea how involved it is until my kids started living it. You sacrifice the nicer things in life to make it to the next rodeo. We have all experienced the frustration of trying to catch a horse that doesn't want to be caught. Here are some great tips for doing so. Keep a matter-of-fact attitude. If the horses senses your frustration with him he is not going to come to you. Identify dangerous areas and mentally fence them out of bounds. If you have someone helping you put them near these areas and have them stand still unless the horses comes towards them. Then, shoe the horse away. Plan to approach the horse from either the left or right, not head on. Horses feel threatened when they are approached head on they know they are about to be attacked. Approach the horse, but stop before he moves. This gives you the control not the horse. Kiss to get the horse to look at you. Quit kissing when he does. Control the horse’s movement and direction, working toward getting him to look at you longer and longer. This is the same manner in which the head or boss horse uses to kick the other horses off its hay. Step to the side to encourage him to turn to face you. Continue doing that, moving closer to him until you can pet and halter him. We are all guilty of doing theses things to catch our horses and though they work on occasion this is not the safest or most effective way to get long lasting results. Here is another great opportunity to learn from one of the best. So if you are in Montana in June, you may want to check this out. Well maybe he won but that definitely is a winning smile! A few months ago our son was having a hard time catching his break away calves. As a young roper he was having a hard time changing from team roping to break away and vice versa. I think this is something that every young roper struggles with. My brother in law was helping us and watching him and told us that he wasnʼt getting his spoke right and that is why he wasnʼt catching. 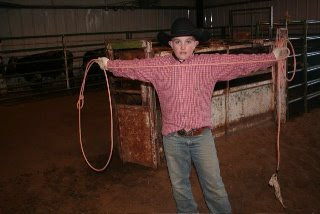 The reason he was catching in the team roping is because he had learned to make his team roping loop big enough. Once he started changing his loop for the event he was competing in, he has had more success. If you are having trouble catching in both events try these two tips and see if they help you like they have helped us. To measure your spoke Zeak goes from fingertips to arm pit. Slack is another important part of a correct loop. Zeak measures from out stretched hand to out stretched hand. In the team roping your loop may need to vary from steer to steer. Zeak measures from out stretched hand to out stretched hand for the right loop. This is the loop that gives him the most consistency. Final thing is to put a smile on your face, have fun, and catch! What queen doesn't love a white felt hat but what do you do after it falls in the dirt a couple of times? Baby powder or cornstarch are a great way to get them sparkling white again. We always state that you should learn from champions. If you are in Utah in April, you have the opportunity to learn from one of the best. The first two days are private instruction. Private lessons are $150 per hour. You can take as many hours, bring as many horses and pick the lesson you want. Saturday we will have a break-away school for beginners and intermediates. The breakaway on Saturday will be $200. 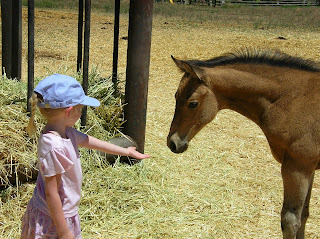 Or you can get the flyer from www.allhorseutah.com. How cute are they? They are so happy when they are at a rodeo! 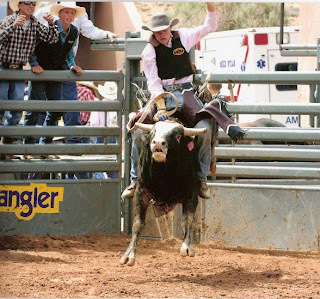 Bull riding is about keeping your mind in the middle for the eight second ride. But it is so important to learn some simple steps to get off and get out of harms way. Practice these moves on a barrel before you try to get on a real bull. Good luck make sure you hustle, have fun, be safe, and represent the sport well. Bull riding isn’t just about saying you are a bull rider; it’s about getting on making the whistle every time and improving on your own skills each ride. 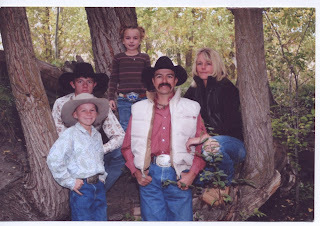 As a young girl living in southeastern Idaho I dreamed of being the best cowgirl ever. Don’t know that I dreamed of pulling a load of bull riders, calf ropers, team ropers, goat tiers and barrel racers. Thirty five years later and I can’t believe I’m living a dream! Growing up I always had a horse, wanted to rodeo and be in the arena. A large farm life led me to learning to work hard, long hours and late night suppers with little TV. Sounds like a deprived child hood? Guess again, its lead me to a love for life, a desire to finish everything I start and be patient about everything I do. Finishing high school and heading on to college was an exciting time in my life. Finding the love of my life, Casy a world class horseman and bull rider things were looking good. The reality of finding the right guy didn’t take to long; he was just about finished with his education and ready for a wife. We were married the next year, I don’t think he knew what he had gotten himself into! A six foot, blond women, hot headed with little experience in the marriage department. We had lots of those ups and down’s I think most marriages experience. I could write about that but it would be a long story, which we will save for later. I want to touch a little on the fact that I married the greatest guy ever who I drug through hell and back for a couple of years. He had girls waiting for me to sign those divorce papers, to bad for them I pulled my head out of my rear and looked to heaven for some kind of sign. Well I got my sign. It was a wonderful May in 1999. We had just had our second son in January and things had been a little rough. Shad’s first four months were a little frightening he had pneumonia twice and been in the hospital for a week. Heaven had quietly been knocking on our door about getting our lives in order, but we were too stubborn to listen. We figured we had been living better than before and pretty much we were unstoppable. May 26th was a day that will go down in the books a complete miracle. My husband had called me from school and told me the cows on the bench were headed to the neighbors hay field. I needed to get to the bench to push them back down to the river. We were on the neighbors crap list already! I called a friend who lived in Vernal to see if she could help. She was excited to go for a ride and brought her son with her to ride with my six year old, Dixon. As I walked to the horses I decided to ride a new mount, a team roping horse we had been trying out. Scioto was his name, weighing a good thirteen hundred pounds and standing sixteen hands he had a lot to offer. I had gotten along good with him and would try him outside the arena today. Deb, Kayla and Jared arrived soon and we decided that Kayla would stay and watch Shad and the rest would go chase cows. We had hurried along, so we could get a jump on the cows. Arriving at the bench we jumped the horses out and made a plan. As we left the truck, Deb was sure I needed to take her cell phone so I could check on Shad. We argued for some time but then decided it would be good to have if Kayla called. The landscape consisted of cactus and alkali and sand. It was a wonderful morning and we headed down the dug way towards the wild bovines that were across the river. Deb, Dixon and Jared headed to the west down the river to gather cows to bring back with the herd I would gather. I decided to go across the river and gather ten pair and push the cattle west also. The river was low and spring was really starting to show the signs of dryness. My ride for the day was working quite well, and I was excited that I might get to purchase him to head steers on. Cattle do have a mind of their own and as we crossed the river half of the breech herd headed straight up the cliffs the wrong way. Strong willed I have to say is a character I was born with and the cattle were not going to get a jump on me. With some speed I asked my horse for another gear and decided I would need to move to higher ground to head the cattle back to the correct direction. As I moved up a large ravine, my mistake of the morning was evident. When I had saddled my horse, I had hurried things too fast that morning and left the breast collar on another saddle I rode more often. Psycho Ride had just realized that my new saddle’s back cinch had moved to his flank and scared to death he decided to remove the itch in his belly. We had no where to go other than down an eight foot slough off and into a ravine. I had never experienced a horse that bucked with so much power! Waking up alone and in excruciating pain, I pulled myself up and out of the hole. Praying with all earnestly heart, I plead with my heavenly father I would make it and that I would be able to raise my children. Thank heaven for the cell phone in my pocket. As I lay in the sand under a large ravine, blessings poured out as my phone worked when I dialed 911. A women answered asking me what my emergency was? I told her I had been bucked off. Surprisingly she asked me off what? A horse, do you know where you are? I didn’t know – she started to ask me different locations that I was close to. When she said Randlett I said yes and then she said Leland Bench. That was it; I gave her exact location to my whereabouts, above a river bend and near a head gate in an irrigation ditch. Shortly after my friend Deb arrived with the boys. Dixon jumped from his little mount Spur and grabbed my hand. Deb said your legs are broke? Unfortunately I told her it was worse than that and to go get the truck and bring it down the seven mile base of the cliff to where I was, and we would have to meet the ambulance. I knew we needed to hurry because I didn’t have long. Dixon held my hand as Deb and Jared went to get the truck. Dixon told me a revised version of the Three Bears and then he said a child’s prayer and I knew God sent angels to protect us until helped arrived. 45 minutes later helped arrived, as the E.M.T.’s stormed down the hill, they started asking all kinds of questions and I could sense urgency in their voices. I knew my neck and back was ok, but my left side was filled with intense pain and my right leg I thought was going to burn in half. After strapping me to a back board and finally finding a vein, they put me in the back of Deb’s truck and drove seven miles along the bumpy cobble rock cattle path. We arrived at the ambulance and the wild ride started; it felt like we were flying, only once we stopped on our way to the Uintah Basin Hospital in Roosevelt. Deb had called Casy when they put me in the ambulance and told him I had been in accident. She didn’t have the logistics she just knew I was pretty hurt. Casy waited over 45 minutes before he heard the cries of the ambulance. Sad to say once I got their they wouldn’t let him in because of the high trauma. Finally he told a neighbor he was going in no matter what. If I was dying he was going to hold my hand. I remember clearly almost everything. They told me they were going to check to see if their was fluid or blood in my stomach? It felt like a staple gun, going into my side. A team roping friend was there that day and he and the lead trauma guy were arguing about taking a c scan to see if my neck or back were broken. Kelly my team roping friend talked him into the C Scan. Nurses were frantically trying to get a blood transfusion going, and others were busy doing what they do. Casy stood at my head and stroked my hair and told me it would be ok. It was time to go to emergency surgery; I was bleeding inside and no stopping. As we were headed down the hallway and surgeon asked Casy if he had any questions. I told him to not kill me, I had been this far and didn’t plan on being done. He assured Casy and I he was the best internal specialist around. Blessing after blessing were in my court this day, just a few weeks prior a little girl had similar injuries and they tried to fly her to the Wasatch front – sadly she bled to death. There was no internal specialist on call that day. After some intense surgery I was in ICU. After waking up, the nurses asked how my pain was? All I could say was it hurts, it hurts. The nurses had given all of the morphine my body could have. Really there was nothing more to do. Casy called his uncle and cousin who came and anointed my head with oil, and gave me a priesthood blessing. I then slept. The next day; I was moved to another room. The Dr. came in and told me every thing looked good. He removed my spleen and the blood transfusion went well. My body had lost 7 units of blood; I suffered 13 broken ribs, and tore up my right knee. After resting in the hospital for two days, the doctor told me if I could shower I could go home. Hello hot water – good bye hospital. As I went home I felt over whelmed with thankfulness in my heart for my life being saved. As the next few weeks unfolded and I recovered, I started to read the scripture, I knew of the truths in the pages and my testimony was growing. I had been saved for a reason; my life had been one of carelessness and abuse of others. I needed to change, and I know as I had lain in the sand that day I had a conversation with an angel or maybe Heavenly Father and I had promised that if my life were spared I would devote the rest of my life to saving others. Thank goodness for the prayers and fasting of others, it was their faith along with mine that saved my life and my soul. 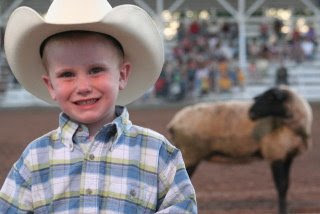 Leaves me more time to be a rodeo mom, help my children, and others succeed with their goals and dreams. Thirty-five more years of hauling the big rig up and down the road for a life full of memories.